Policy leaders must redesign global economic incentives to advance healthy diets, and take a harder line against commercial interests promoting excessive production and consumption of unhealthy foods. Current trends are driving the inter-related pandemics of obesity and undernutrition as well as climate change, according to a new report by The Lancet Commission on Obesity. The Global Syndemic of Obesity, Undernutrition, and Climate Change, released yesterday, calls for a new global treaty on food systems to limit the political influence of what it describes as “Big Food” driving both ill health and climate change. 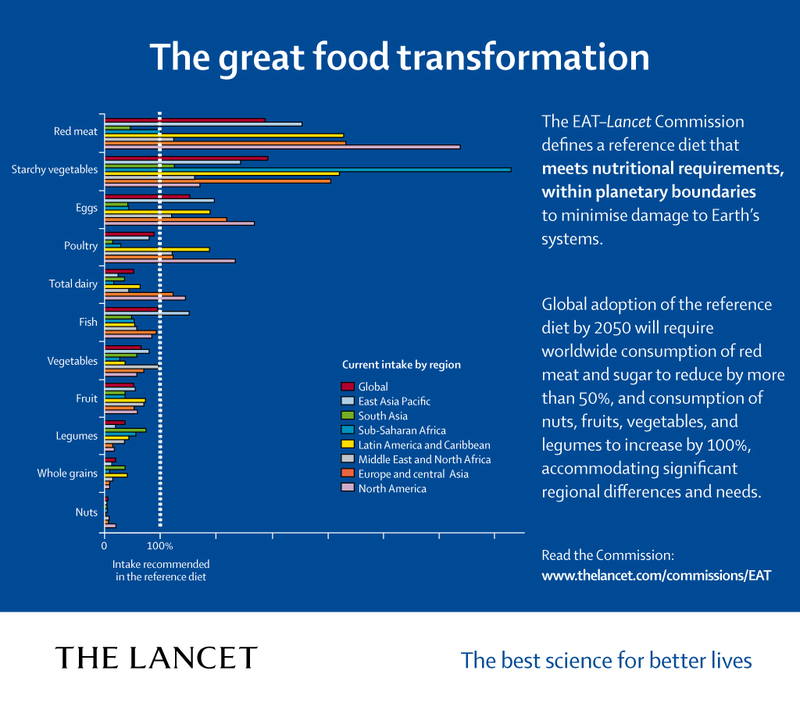 This, the latest in a series of recent Lancet Commission reports and articles on diet, health and climate, focuses squarely on the policy drivers of unhealthy food production and consumption. The article follows upon the release 17 January of the EAT-Lancet Commission on Food, Planet and Health, which said that some 11 million deaths could be averted through healthier diets, including a 50% average reduction in worldwide red meat consumption. The EAT-Lancet’s “universal reference diet” for both health and climate sustainability, recommended that most protein sources to be plant-based, with modest consumption of fish, poultry and eggs, alongside a diet with ample fruits, vegetables, nuts and legumes. Healthier diets could avert about 22 percent of premature adult deaths every year, for a reduction in 11 million premature deaths a year from less heart attack, stroke, cancers, diabetes type 2 and other obesity-related diseases, predicted The Lancet, in a scientific journal article on the same topic, published 16 January. A key recommendation is to establish a new global treaty on food systems. It proposes a Framework Convention on Food Systems (FCFS) – similar to global conventions for tobacco control and climate change – to mobilise national action for healthier, more equitable and more sustainable food systems. The Lancet Commission report, led by the University of Auckland (New Zealand), George Washington University (US), and World Obesity Federation (UK), is the result of a three-year project led by 43 experts from a broad range of expertise from 14 countries. Malnutrition, which includes both undernutrition and obesity, is by far the biggest cause of ill-health and premature death globally, and expected to become worse with climate change, the report emphasizes. On the one end of the spectrum, 2 billion adults are overweight and obese, and diet-related noncommunicable diseases including diabetes, cancer and heart diseases are among the leading causes of global deaths, the report notes. On the other end, 155 million children were stunted and 52 million children were wasted from lack of adequate food in 2017. Two billion people suffer from micronutrient deficiencies, and 815 million people are chronically undernourished, notes a policy brief accompanying the report. Obesity, undernutrition and climate change have typically been treated as separate, and often siloed issues in the health sector. Policy responses have been unacceptably slow due to reluctance of policy makers to implement effective policies, opposition by vested commercial interests, and insufficient demand for change by the public, the report finds. Meanwhile, food production is one of the largest contributors to climate change, contributing nearly one-third of climate emissions, directly or indirectly. Livestock alone account for 12–19% of greenhouse-gas emissions, with both meat and dairy products requiring more resources and generate larger emissions of the powerful greenhouse gas methane than plant-based alternatives, while consuming tremendous land resources. Additionally, non-seasonal fruits and vegetables produce substantial emissions when grown in greenhouses, preserved in a frozen state, or transported by air, and carbon emissions from food waste rank third, after all national emissions by the United States and China, the report finds. Policy drivers related to transportation, urban design and land use also can promote overconsumption and inequalities in access to healthy, affordable foods, for instance “food deserts” in the residential neighborhoods of some high-income cities, where fresh food grocers have been replaced by fast-food chains. And industry spends tens of millions millions to lobby against initiatives on food labeling and sugary drinks consumption, the report notes, as an example of industry clout. The Lancet Commission report says that sweeping redesign of economic incentives is required, including redirecting the estimated US$ 5 trillion in government subsidies that now goes to the fossil fuel industry and agro-businesses, to more sustainable, healthy, food production, marketing and distribution. “The prevailing business model of large international food and beverage companies that focus on maximising short-term profits leads to overconsumption of nutrient-poor food and beverages in both high-income countries and increasingly in low and middle-income countries. The coexistence of obesity and stunting in the same children in some countries is an urgent warning signal – and both will be exacerbated by climate change,” said Dr Richard Horton, Editor-in-Chief, The Lancet, in the press release. “With market power comes political power, and even willing governments struggle to get policies implemented against industry pressure. New governance dynamics are needed to break the policy inertia preventing action,” says Commissioner Tim Lobstein, of the UK-based World Obesity Federation, in the press release. See more content on the Commission’s report on obesity here.